In the Kabwe District of Zambia, Adamson Andrew Tembo is the acting senior agricultural officer (SAO) working with the Ministry of Agriculture. He is trained as an agricultural engineer and his role has been as an irrigation engineer. He was transferred to Kabwe District in January 2017 and assumed the role of SAO in July that year. Kabwe district has five plant clinics; one permanently based at Chililalila and the rest mobile plant clinics; operated by two plant doctors. Although Mr Tembo has not been trained as a plant doctor, he has access to a rich Plantwise informational resource; the Plantwise Factsheets Library app on his phone. Nuclear Development in Zambia: A Positive for Environmental Protection? A rural nuclear power plant (© Pexels). The agriculture sector in Zambia employs around half of the country’s labour force and provides the largest source of employment opportunities for rural women. However, although the sector contributes 6.5% GDP and 9.6% of the national export earnings, the industry is one of the most under-developed in the country. Last night, the Pest Risk Information Service (PRISE), which uses state-of-the-art technology to help inform farmers in sub-Saharan Africa of pest outbreaks, was launched in Zambia at the British High Commission in Lusaka. The service is being developed by a consortium led by CABI and is funded by the UK Space Agency’s International Partnership Programme (IPP). Datasets obtained from a combination of the plant-pest lifecycle, earth observation and satellite positioning, are being used to spearhead the fight against pests that devastate an estimated 40% of the world’s crops. The project will help farmers fight back against potentially disastrous pests such as the Fall Armyworm. By Matthew Hill and Taonga Clifford Mitimingi. Reblogged from Bloomberg Markets. Zambia must intensify its fight against an outbreak of armyworms that’s wiping out fields of the staple corn crop, posing a threat to the southern African nation’s food security, Vice President Inonge Wina said. CABI has opened a new Southern Africa office in Lusaka, Zambia, putting staff on the ground to strengthen its work in international development. The CABI-led Plantwise programme has been active in Zambia since 2013. Working closely with national agricultural advisory services, CABI and national partners establish and support sustainable networks of plant clinics, run by trained plant doctors, where farmers receive practical plant health advice to help them lose less and grow more. To date, Plantwise has helped establish 42 plant clinics and trained 77 plant doctors in Zambia, reaching thousands of the country’s farmers. Here’s a taste of some of the latest stories about plant health, including a model for sustainable onion production in India, a new training guide produced by FAO and ILO to protect children form the harmful effects of pesticides and a Chinese agricultural technology company providing support to improve food production in Tanzania. The saying “prevention is better than cure” is no more true than when applied to agriculture. Taking precautionary measures against common pests can increase farmer income by investing a small amount of money into minimising crop losses, ensuring a high yield. Preventative measures can include correct land preparation, physical barriers, field hygiene and cultivation of tolerant varieties. Unlike resistant varieties, tolerant varieties can host the pest, but are not seriously affected by it. Different varieties have different levels of tolerance to different pests. It is therefore important for farmers to select a variety with tolerance to the pests known to occur in their area. This month’s Factsheet of the month ‘Tolerant bean varieties against stem maggots’ provides information about the use of bean varieties tolerant to stem maggots, also known as bean flies. 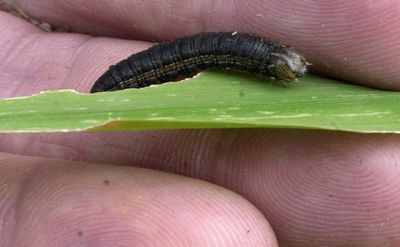 Stem maggots are an important pest of legumes found mainly in Asia and East Africa. They feed by tunnelling into leaves, stems and roots, weakening the plant and increasing the chance of death in younger plants. This factsheet was written last year by staff from the Zambia Agriculture Research Institute (ZARI).